"There are 5,000 people in Letterkenny. These are their problems." Those problems are mostly contained within the "hicks" (farmers), "skids" (drug addicts), hockey players, church people and the neighboring reservation. Confrontation of all kinds is a key comedic element of Letterkenny. Keeso, the driving force of the series, plays Wayne, the toughest (but also, weirdly, the nicest) guy in Letterkenny, who is a hick and runs a produce stand outside of the family farm, which is basically just a setup for sitting around and talking. He does that with best friend Daryl (Nathan Dales), often shortened to "Dary". Wayne and Daryl often riff with Squirrely Dan (K. Trevor Wilson), who adds an "s" to just about every word that comes out of his mouth. 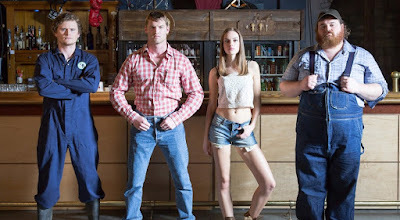 The first two seasons of Letterkenny can be streamed on Hulu right now in the states.